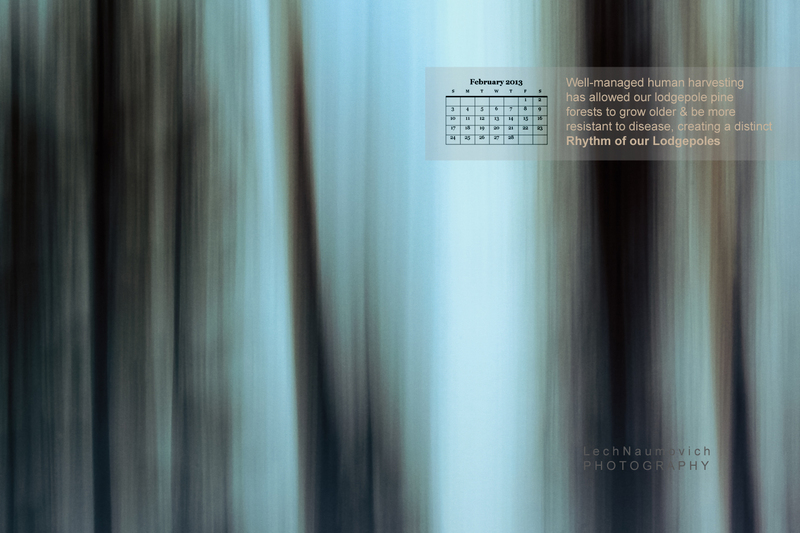 My February calendar download pays tribute to a wonderfully, snowy lodgepole pine stand. I warn you, it’s abstract. In that, I think this sweeping long exposure provides a lot of ecological information on the stand. From this abstract you get a sense of openness and light in the forest stand – this has shown to decrease pine bark beetle invasion and help maintain larger trees for longer. Yes, this is reason to go hug your favorite forester. The openings, the hand of humankind in its management have created the rhythm of our lodgepoles. This photo hails from a lodgepole stand in Whitefish, Montana. I hope you enjoy the still sleepy, cool tones of the end of winter. Please feel free to click on the image and save it as your desktop calendar for the month of February. Or you can click here for the direct link. PS Why is rhythm such a hard word to spell if its just so important in life?